This week’s a little light on Blu-ray releases of any note save for Scorsese’s recent foray into gothic psychological terror and an old comedy fave from the 80’s. Gunga la-gunga! From the 80’s vault comes Caddyshack (Orion/Warner Bros., 1980) in a spiffy Blu-ray 30th Anniversary Edition that makes me feel rather old when they start posting numbers like that on home media releases (I saw the film in a movie theater at age 10 during the time when my Dad had weekend child-rearing duties… he’d take us to see just about anything including that particular brand of 80’s comic raunchiness). The movie, for those too young or living in a cave to catch up on older releases from a bygone age, concerns a bunch of upper-crust rich snobs who find their country club haven seemingly under attack by the lower-class blobs, yobs and slobs who caddy, clean and maintain the grounds of their hoity-toity sanctuary. That’s just the threadbare plot, which is really just a way to hang a bunch of gags and classic improvisations performed by a ramshackle ensemble of comics sprung from the ranks of National Lampoon, SNL, Second City and the stand-up circuit. I’ll say this… if you aren’t yet privvy to this film, then at least rent the damn thing and join the rest of us in reciting the movie’s classic lines— lines that, while they might not seem funny on the page, play so well in context to the film that they’ve become memorable shorthand for film geeks and the general public alike –a kind of badinage you toss off to friends casually (“Hey, Lama, how about a little something, you know, for the effort, you know.”) or pop in at the appropriate moment (“doooooooooooooodie!”). 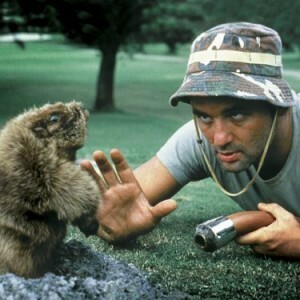 Caddyshack, despite its age, is still a must-see comedy for those who appreciate sophisticated humor (and golf) wrapped up in the guise of populist, low-ball comedy. The flimsy narrative (protecting Bushwood Country Club from both dancing gophers who dig Kenny Loggins and the great unwashed) occasionally gets sidelined by actual plot wherein average, likeable Danny Noonan (Michael O’Keefe), one of several Irish-Catholic Noonan kids, goes looking for college funds by sucking up to one of Bushwood’s most eminent members, Judge Smails (a vein-popping Ted Knight, all wound up at a perfect comedic pitch), when he’s not lackadaisically caddying the courses or taking tips on the zen of golfing and life from smart-assed rich boy Ty Webb (Chevy Chase). Add to that mix the zonked-out assistant groundskeeper Carl Spackler played by Bill Murray in a mid-career role that seems rather unusual in light of his later devil-may-care performances, but fit in perfectly as he transitioned from the long shadow of his Saturday Night Live work where he had a goofy quality that current SNL cast member Will Forte has kinda tapped into. It’s Murray’s presence, along with Dangerfield’s boorish swagger, that makes the film more memorable than it probably should be… rather than being Chevy’s Chase’s show (though his lines are perfectly delivered and no less funny), Caddyshack seems to be remembered best as Murray’s golden opportunity to truly flex his chops especially during the now famous monologue that has Carl recounting his days caddying for the Dali Lama (astonishingly, the Dali Lama has actually been asked if he’s seen the movie by former pro-wrestler/actor/governor, Jesse “The Body” Ventura). Mind you, this is a monologue that more contemporary people have probably memorized than they have a Shakespeare soliloquy… which only underscores the impact this film (poorly reviewed and semi-popular at the time of its release) has had over the past few decades. The Blu-ray isn’t going to knock your socks off, from what many are already saying about the disc… fact is, it’s an 80’s release that has gotten some love from the Warner Home Video, but is still not being given a major high-def overhaul (the 20th anniversary DVD gave the movie a sprucing up, but the Blu-ray is probably on par with that version when upscaled to 1080i/p). The VC-1 encoded 1080p / 1.85:1 widescreen feature isn’t always as sharp as Blu-ray offerings can be, and the DTS-HD Master Audio 5.1 is generally being reviewed as adequate for a film that wasn’t a sonic showcase to begin with even during its explosive ending. 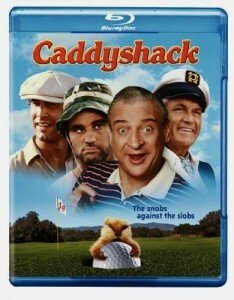 A DVD feature called “Caddyshack: The 19th Hole” is ported over to the BD version and features some of the cast (minus Dangerfield and Murray) along with the crew and creators as they discuss various aspects of the film’s production from script-to-screen and everything in between. The 30ish minute documentary offers some on-set outtakes (with more cast improv), as well as revealing how the entire concept of Caddyshack changed over the course of filming due to the improvisational skills of the three well-known comics. While that feature is SD, the other bonus feature is exclusive to Blu-ray, though it covers basically the same fairway as “The 19th Hole.” That BD bonus in 1080i is called “Caddyshack: The Inside Story,” and was previously featured on cable’s Biography Channel as infotainment. Here you get nearly an hour and a half’s worth of unseen footage, bits of life on the set via photographs and Super-8 vignettes, and a host of other goodies regarding everyone’s favorite golf movie (sorry to upset you Bagger Vance fans). Is it worth buying. mmmmmm… yeah, if you’ve got money to burn and nothing else to do, for, as the Zen philosopher Basha once wrote, ‘A Blu-ray disc with no holes, is not a disc . A donut with no hole… is a Danish. '” Funny guy, that Basha. 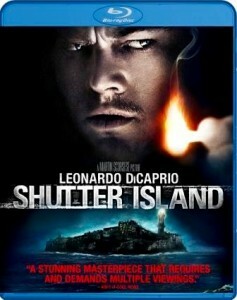 Martin Scorsese is well revered for his amazing achievements as a filmmaker and film preservationist… at this point, the guy can pretty much do whatever he wants, and in the case of Shutter Island (Paramount, 2010) he decided to tip-toe into the horror genre with a psychological creepfest that takes place in a gothically styled hospital for the criminally insane. Leonardo di Caprio, now well into the adult phase of his career, but now seeming more like a man rather than a boy playing at being a man, stars as U.S Marshall Teddy Daniels. Along with his partner Chuck, he’s determined to find out the mystery of a missing patient, while bidding his time for an ulterior motive that may ultimately make his mind unravel. Since the plot’s the thing in this movie (and the twist is telegraphed a mile away), I’ll leave it to you, Dear Reader, to see it and decide if our eminent American auteur has hit the mark or missed it. Scorsese does bring a lifetime of film history to the dark drama, and shoots the 50s-era scenery with a sense of dread straight of the film noir handbook. The performances are terrific and fit right into the pulp mystery, with Ben Kingsley, Mark Ruffalo, Max Von Sydow and Jackie Earle Haley all contributing fine character performances (though Michelle Williams is good too, it’s not nearly a character part that she can really make memorable). 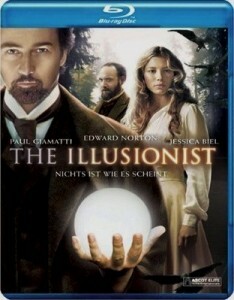 The Blu-ray features an MPEG-4 AVC 1080p image in 2.35:1 widescreen that reviewers are calling excellent with controlled color saturation, pitch black levels that still reveal a wealth of detail and, with Scorsese using a variety of different film stocks, video and camera hardware to achieve the look he wanted, manages to maintain a theatrical quality presentation that should make fans of the director and this film quite happy. The DTS-HD MA 5.1 audio mix is said to capture the finest aural ambiance while allowing for crisp dialogue and showcasing the rich tapestry of modernist classical music developed by Robbie Robertson. The BD version offers two extra features: “Behind the Shutters” (HD/1080p) has nearly 20 minutes of EPK-styled interviews with the cast, crew and the author of the book, Dennis Lehane and director Martin Scorsese, while “Into the Lighthouse” (HD/1080p) offers just over 20 minutes revealing the psychology behind criminally insane minds and the business of psychiatric institutions then and now. This is a worthy addition to your Scorsese collection (you’ve got one, dont’cha!) and your HD video library. If you didn’t take much to the film on its theatrical release, now your chance to give it another go on Blu-ray, as Scorsese’s films are always rewatchable and on repeat viewings reward the viewer with more satisfying depth than they might have experienced during the first go-round.